The leader of the UK’s Labour Party, Ed Miliband, has stated that his party will not commit to a referendum on Britain’s EU membership unless there is a further transfer of power to Brussels. Eric Shaw ponders the significance of the announcement and whether it does anything to help Labour and Miliband’s leadership credentials. As for its electoral impact, the speech will probably make little difference either way. Ed Miliband has announced, in a well-trailed and extensively publicised speech, that Labour favours an in/out referendum on EU membership but only in the specific circumstance of a fresh transfer of powers to Brussels. This is deemed to be highly unlikely so, in effect, the party has set its face against a vote in the next parliament on whether the UK (with or without Scotland) should remain part of the EU. The speech is a major political intervention in an area which has been a graveyard of political reputations, but what does it signify? What does it tell us about Labour policy, party management, strategy and, not least, the Miliband leadership? First, policy. Taking account of prevailing public sentiment Miliband called for a range of EU reforms, notably lengthening the transitional period during which restrictions can be placed on immigration from new member states, making it easier to deport law-breaking immigrants and completing the single market in energy, services and the digital economy. However these reforms, according to Miliband, could be accomplished within the parameters of existing treaties and did not entail any transfer of power to Brussels (a point some might query). Second, party management. One Labour MP denounced his leader’s referendum formula as a ‘shoddy compromise’. Well, managing parties is about reaching compromises where views differ. Miliband’s proposal was an attempt at balancing between the pro-Europeans in the party and those clamouring for an unequivocal commitment to a referendum. The EU used to be an explosive issue within the Labour party – it was a major factor behind the formation of the SDP in 1981 – but this is no longer the case. Miliband’s assessment is that this partial commitment to an in-out referendum will suffice to defuse tensions within Labour’s ranks and satisfy those – the large majority – for whom the matter is less one of principle than a distraction from more pressing problems. Third, strategy. Miliband has repudiated the views of populists within his party (including some frontbenchers) who argue that not only is there a groundswell of opinion favouring an unequivocal commitment to an in-out referendum, but that satisfying it is the only sensible strategic option. It seems that Miliband is disinclined to allow policy to be driven by waves of populist sentiment on this or other issues. Furthermore, he appears to calculate that the public mood over the EU is more one of irritable exasperation than deep-seated hostility. It is not an issue which – except where it is coupled with the toxic issue of immigration – arouses the passions of the British people. As for its electoral impact, Miliband’s speech will probably make little difference either way. It does leave Labour open to the accusation that it does not trust the electorate. Cameron was quick to point out that, under a Labour government, there would be “no referendum, no choice, no reform, nothing.” Strategically it allows the Tories to appeal to UKIP voters on the grounds that only by voting Tory at the next election would they have the opportunity of quitting the EU. But Miliband will be well aware that opinion polls have consistently relayed the message that the EU is not a key battleground – though Labour is relying on a strong UKIP vote to enable it to seize some Tory marginals. As far as the UK’s fourth party is concerned, Miliband’s move does bring Labour closer to the LibDem position on a question dear to Liberal hearts. Whilst Labour frontbenchers insist that they have their eyes set on a majority Labour government, many know that the narrowness of the party’s polling lead may mean that a Lib-Lab coalition may be the best they can expect. Finally, the Miliband leadership. 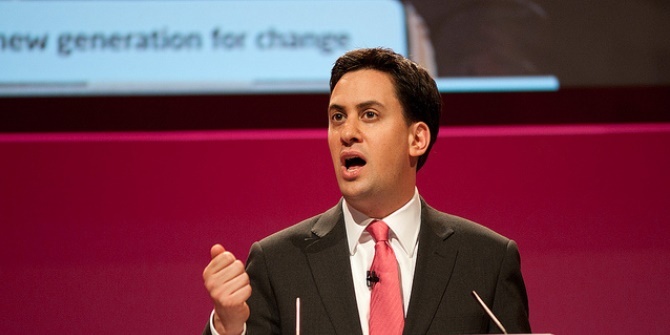 The speech is doubtless designed to buttress Miliband’s credentials as a potential PM. As Peter Mandelson insisted on the Today programme, is was the act of a strong leader. Predictably, Tory MPs were quick to denounce the speech as one more example of Miliband’s lack of spine, his equivocation and his unsteadiness under fire – accusations which would be made whatever the Labour leader did.